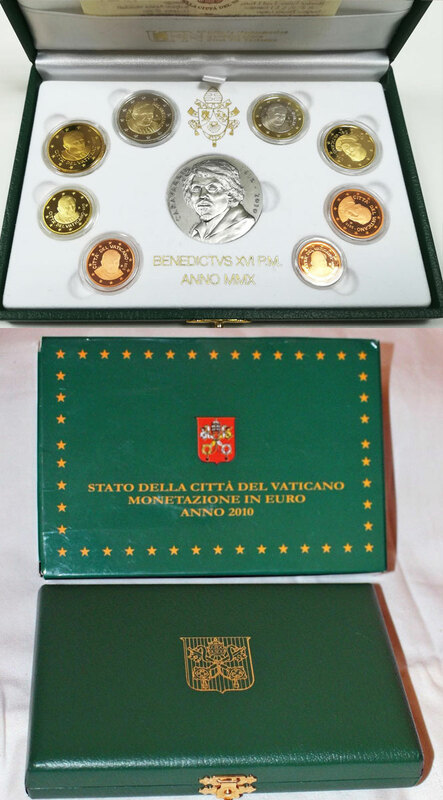 Vatican 2010 set of 8 coins: 1 and 2 Euro; 50, 20, 10, 5, 2 and 1 Eurocent, Proof version. In original plush case and includes a silver medal, specific to the proof set, commemorating the 4th centenary of the death of the artist Carvaggio, 1610-2010. Medal sculpted by Amalia Mistichelli. Mintage of the Proof coins and medal is 15,000.